In a time of breath taking, bar-raising musical virtuosity and blisteringly hot technical prowess in the world of the mandolin, it’s refreshing to engage listening experiences that are less about the wow factor and more about music that offers joyful, sensual emotionally felt journeys to different times and places with a feeling of satisfaction that finds me wanting more. Mandolin Heaven is a fine effort by an angel of a guy who, in addition to the creation and performance of his own music, has passionately promoted the music of other artists to listeners through the years with his own radio show. This collection of tunes deserves a listen and consideration for your music collection, however that exists in this digital age. It’s music that can fit many occasions in our active, complex lives. How many poorly performed versions have I heard in my lifetime? Too many! The Silent Fountain original (cassette tape & LP) set the standard of perfection! I asked myself How could anyone improve on it? That was my initial response to hearing about what you were doing with Silent Fountain. Over the past decade or so Bruce Zweig helped with technical conversion to MP3s, Gus Garelick and his Frittatas contributed great CDs and his group benefited from Gus's arrangements of these classics, and of course, my own ensemble and "Mando Liscio" CD spent much in preparation and rehearsal for our recording at Caffe Trieste studios. But I know that you devoted several months recording, mixing, and perfecting this ensemble of parts. Members of the Jubilee Klezmer Band rehearse their distinctive high-energy, soulful music: From left, Phil Lawrence, mandolin; Paul Alexander, clarinet; Sonia Tubridy, accordion, and Mark Peabody, double bass. Traveling down Liberty Street on a late Sunday morning, one might catch an earful of an accordion droning and a bittersweet clarinet melody wafting through the air. The music is somehow familiar, yet foreign, like it could be coming from another time and place. Bulgaria, Israel, Romania ... Petaluma? What you may be hearing is the Jubilee Klezmer Ensemble, a Sonoma County quartet that blends klezmer and Israeli dance music. Rehearsing inside a 19th century Queen Anne Victorian, it is hard to believe, nearly 400 years ago, you could find similar songs being performed at a Jewish wedding. The Jubilee Klezmer Ensemble has been collecting these traditional Jewish folk tunes and bringing them to the public for over two years. Paul Alexander and Sonia Tubridy, the founding members of the group, focused their mutual passion for klezmer music, and revitalized a musical genre that has been making a slow comeback since the early 1970s. Centuries ago, nomadic Jewish musicians played a vital role in Eastern Europe, performing wedding songs for the bride, groom, and their families. These weddings could last up to one week and there would be songs connected to everything from the veiling of the bride, the meeting of the in-laws, and walking to and from the chuppah ( a canopy placed over the bride and groom during the wedding ceremony). This early Jewish music later evolved into klezmer music, as it is now popularly known. "Finding klezmer music was like making contact with my faith that I never felt before," says Alexander, who plays clarinet for the group. "It was beyond thought, beyond ideation. It was something I felt in my gut and my heart. I felt like I knew this music and it had meaning to me." Mark Peabody, bassist for the ensemble, shares Alexander's sentiments, stating the music also connects him to his forgotten Jewish heritage. "There is something about having something unresolved in life, and music is a good way of working through things like that. I can't go back and find my Jewish relatives from Poland; I can't go back to that religion. But the music is my way of looking at the culture and finding a place within it. I listen to the music and think back on my ancestry and it's a way of connecting and I try to feel it on my instrument." Peabody brings a classical and jazz background to the group. As head of the music department at Novato High School, he states that despite klezmer's folk tradition, it transcends many of his expectations as a musician. "I have played all kinds of world music in my life, Gamelan, Eastern Indian music and Latin styles. It's interesting putting klezmer together with the other experiences I've had. Including the jazz and the classical. Music has many different languages and you have to learn the idioms and the messages of the music. "This music is a way of connecting up with something. I have always liked to look at life as a series of things you are trying to resolve, and as you do it adds to your clarity as a human being." Tubridy, resident of Guerneville, contributes much of the Israeli music knowledge to Jubilee. She learned accordion as a teenager, while growing up on a kibbutz in Israel. A classically trained pianist, choral conductor and director of the River Choir, this busy musician finds time to add lively melody and rhythm to the ensemble. The one Italian member of the band was discovered one night at the old Copperfield's Cafe. Alexander met Phil Lawrence, Jubilee's mandolinist, during a performance of bluegrass music. "When I heard how Phil could improvise, I just said, 'Wow! We've been looking for you!" Lawrence has a background in jazz, rock, country, bluegrass and reggae and is a member of a local folk-rock group called Silk and Steel as well as The DLT 3, an acoustic jazz trio. He also teaches English literature and writing at Petaluma High School and often brings his mandolin into the classroom to help facilitate learning. "Paul shanghaied me into the band," Lawrence says, laughing. "I was reluctant at first. I had a band already and I'm a teacher at Petaluma High. He wanted me to learn a whole new style of music. I didn't know where it would fit in. But after a few rehearsals the music grew on me. It's so challenging and interesting. I was hooked." The Jubilee Klezmer Ensemble plays traditional Jewish occasions such as weddings, bar mitzvahs and bat mitzvahs, as well as public events such as this year's Sausalito Arts Festival. The ensemble is excited to be inaugurating the World Music Concert Lecture Series at the Petaluma Library, starting at 7 p.m. next Wednesday, Sept. 25. "In its second year, the music series' mission is to provide a wide variety of ethnic music from around the globe that is free to the public', says Kiyo Okazaki, branch manager of the library. "Last year we honored local groups that performed Mexican serenades, Celtic and European folk and Eastern Indian music. This year we are looking forward to the Jubilee Klezmer Ensemble in addition to a classical South Asian group, modern fusion music from Japan and traditional Andean village music." According to Okazaki, last year the series was widely received and as a result, the community has helped raise almost 90 percent of the $500,000 needed to expand the community room at the library. Next summer they are looking at having a brand new space for their performers. Alexander responded positively to the series as well, and says Okazaki has been very enthusiastic about Jubilee's music. "I gave Kiyo a copy of our CD for consideration into the series. She told me later that, 'My cat and I were dancing around the living room. We just loved it.' Needless to say, the ensemble was invited to open the series." 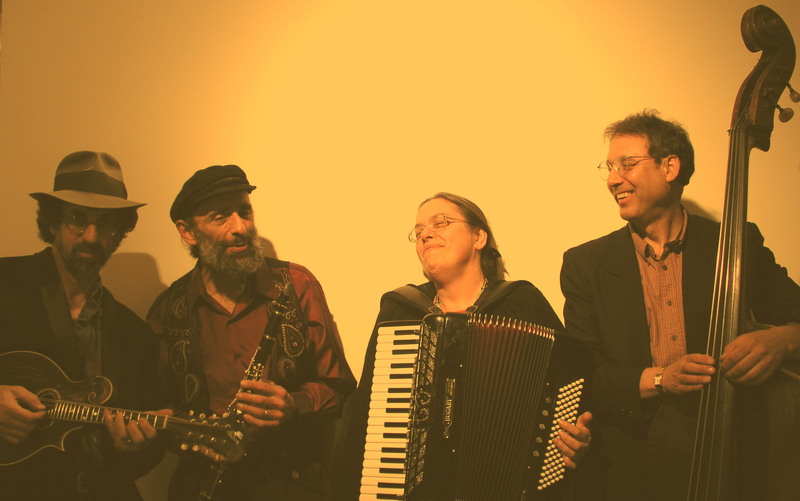 Whether you are a klezmer music enthusiast, or just looking for lively tunes that will inspire you to sway and smile, the Jubilee Klezmer ensemble's reputation for energetic melodies will deliver. The Jubilee Klezmer Ensemble also performs from noon to 1 p.m. Oct. 20 at the Simcha Sunday celebration at the Sebastopol Community Center 390 Morris St.
For more information on the group, go to the Web site: www.jubileeklezmer.com or call 762-1070. The shortest distance between 16th century Poland and 21st century Petaluma is not necessarily a straight line. Rather, it's a melody line played by Sonoma-based clarinetist Paul Alexander, leader of the four-piece klezmer ensemble Jubilee. Klezmer is, of course, the joyous music of the shtetl, now experiencing a renaissance worldwide. Its roots trace back to the Middle Ages, combining far-flung musical styles from Poland, Ukraine, Germany, Greece, Turkey, Israel, the Balkans and Rumania, among others. Back in California, Jubilee has become one of the most popular klezmer bands in the Bay Area, a region already teeming with world-class klezmer musicians. Much of the credit has to go to Alexander, who not only excels in traditional classical music (he's played with the Santa Rosa Symphony, among others), but he has also lent his talents to other local klezmer outfits, most notably the Red Hot Chachkas. Just less than three years ago, Alexander formed Jubilee for the same reasons most iconoclasts strike out on their own. "I wanted to do my own thing," he says. "When you have your own group, you have more say in the direction, the style, the repertory, the whole direction. It's exciting to be at the helm." North Bay music fans will have a chance to check them out when Alexander and his colleagues -- mandolinist Phil Lawrence, accordionist Sonia Tubridi and bassist Mark Peabody -- perform a concert in Petaluma on Saturday, March 22. With so many competing klezmer bands out there, what's so different about Jubilee? "We're a traditional klezmer group," says Alexander, contrasting Jubilee with more experimental, jazz-influenced klezmer. "We enjoy exploring the repertoire and going back to the roots. There's a wealth of repertory to discover." That involves more scholarship than one might suspect. Because the music was handed down "orally" from generation to generation, guild to guild, there had been no written record of klezmer tunes until relatively recently. With the publication of comprehensive early 20th century collections by such musicologists as Wolff Kostakowski, a trove of klezmer tunes has been preserved. Those are the sources Alexander and company mine. While the collected tunes are indeed written out very precisely, the ornamentation -- all the colorful trills, chirps and glissandos that give klezmer its characteristic flavor -- is up for grabs. "One thing about klezmer," notes Alexander, "melody is queen. You don't go far from the melody." Alexander wasn't exactly born into the klezmer heritage. In fact, he had never encountered the music until adulthood. "When I play this music, I feel the Jewish soul," he says. "The joy of this music, the celebration, the love of life and people -- that's the key to klezmer. That aspect of Judaism, a love of family and community, is very important to me." With one CD, "Mazel Tov," available and a new one coming soon, (Raisins and Almonds) the members of Jubilee remain jubilant about their future. "We need to do what we're doing," says Alexander. "People seem to have a hunger for their roots, and when they discover klezmer, they immediately feel something in the blood." "Silk and Steel makes music the old-fashioned way--they play it. Susanna Praetzel, Michael Rosloff and Phil Lawrence sound like they're sitting around their front porch on a warm evening, picking gentle melodies on sweet guitars, singing beautiful harmonies, with enough wonderful songs to last all night." "Listening to Silk and Steel's album is like reading a novel, or hearing a performance of Mahler's sixth symphony. You grow. You become a better person. This is a great album because of the skilled writing, the fantastic singing, and most importantly the range of topics written about with such sensitivity." "Silk and Steel's album is original and arresting, dealing with contemporary subject matter rarely heard on the pop scene." "Silk and Steel's songs never fail to move me--sometimes to tears, often to laughter. Their insightful lyrics and heartfelt vocals enrich and affirm our lives. As I work on my books, I listen to their album, and it always inspires me. "Silk and Steel is a wonderful CD! I just loved it. The songs are strong, original, and hauntingly beautiful." "Silk and Steel's beautiful lyrics and achingly lovely harmonies moved me profoundly. 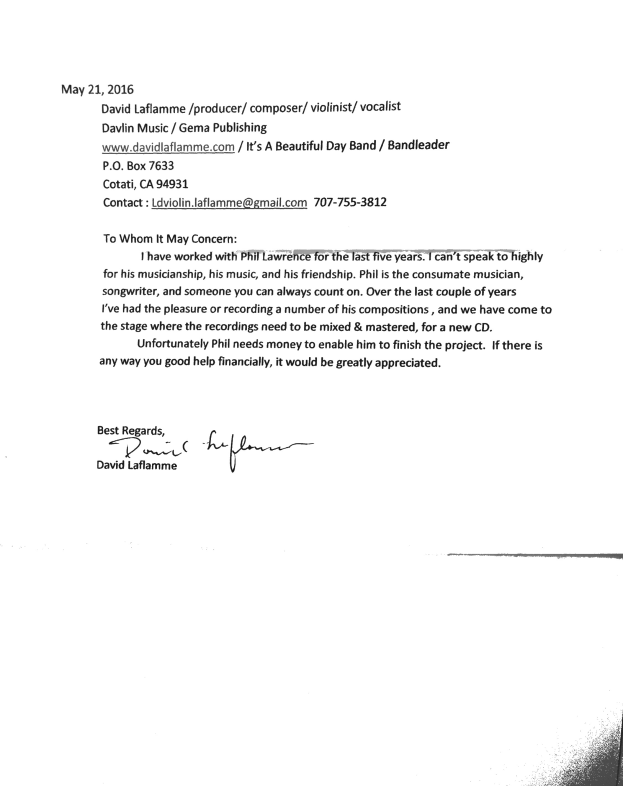 This is a CD I keep handy, and play over and over again." "Silk and Steel - They will comfort your soul, challenge your mind, and surprise - make you laugh! Silk and Steel will carry you through the millennium." "The delicate cover photograph of thistles growing by a wooden post fence effectively captures the style and feel of the eponymous debut album by Silk and Steel, a trio comprised of singer/songwriters Susanna Praetzel and Michael Rosloff and instrumentalist Phil Lawrence. Silk and Steel's musical approach is a clear-eyed, modernist synthesis of the best of their country-rock forebears. Among the fourteen tracks, all composed by Praetzel or co-composed with Rosloff, there are deft guitar flourishes that bring to mind early Dire Straits, magnificent pedal steel and mandolin work recalling Poco's best early albums, with the occasional honky-tonk piano solo and harmonica fills, all of which lend an Americana-authenticity to the production. Topping the pristine arrangements are Praetzel's and Rosloff's warm and engaging vocals. They have the blend of married musicians (which they are) whose voices twine effortlessly around the ear-sticking melodies, who can anticipate each other's every breath and nuance, and whose harmonies don't necessarily go immediately for the easy intervals but find ones more evocative. Praetzel handles most of the lead vocal responsibilities on the album, and she emanates an easy warmth and intimacy in the tradition of Emmylou Harris and Chrissie Hynde - she has the gift of making the listener feel as if she's singing just to them. Rosloff, who released a wonderful solo album of his own several years ago, has exactly the right velvety tenor to complement the mix. The theme which ties the album together is that of families - lost and found, or never there at all. Praetzel sings movingly of an unborn child she'll never know in "I Thought I Saw You", and in the album's stand-out track "Everything I Know", her sweet yodel mourns the loss of the lover whom she'd thought would be the one to last. In "Seven Days", Rosloff sings the tale of a man who leaves his family behind for a week to face the way his life has turned out, alone in the wilderness, only to realize by song's end that his life only has meaning in relation to loved ones. There's self-deprecating humor by Praetzel in "The Quiet Men", where she admits to being fooled (though not completely) by outward appearances, and in the whimsical quasi-country lament "Tell Me That You're Gay". Just when you think you know the groove into which Silk and Steel has settled, they throw you a curve with the final song "Journey To The Moon", an ethereal ballad in which Praetzel relinquishes her love, comparing their relationship to both natural and man-made forces which have somehow been thwarted -- the Apollo 13 voyage to the moon which never got there; seeds that are sown that fail to grow; waves that are sucked back out to sea. The combination of Praetzel and Rosloff's lovingly crafted songs with obviously meticulous attention to vocal and instrumental excellence yields an album that is a balm to the eardrums and a salve to the soul, qualities which are more important than ever in the soundtracks of our lives." By day, Phil Lawrence teaches at Petaluma High School. At night, he and two fellow Bay Area high school teachers are members of a band called Silk and Steel that performs at festivals and coffeehouses. They will appear Saturday at the next installment of the Petaluma Folk Music Series. Band members joke that their hours in the classroom augment the time they spend practicing together. "Being surrounded by teens keeps us young," quipped Lawrence, who plays mandolin, guitar, bass and sings with the band. Lawrence, 51, who teaches English, can trace his love of music to a teenage encounter across the country with a Petaluma High faculty member and one of the most famous rock concerts ever. At age 15, the Brooklyn-born Lawrence was working at a summer camp in New York, when he became acquainted with Mike Simpson, the principal at Petaluma High. Simpson was instrumental in dropping off Lawrence and some other young people at Woodstock for the day. The experience would have a lasting effect on Lawrence, who had stopped playing the clarinet and the piano to concentrate on basketball. After t he festival , Lawrence bought a harmonica and learn ed guitar. A devoted fan of the Grateful Dead and Bob Dylan, he took to the streets of San Francisco, trying to build a career in music by performing at bars and living from m oney dropped in his guitar case. His dream came true with he heard David Grissman live, and then was fortunate enough to play mandolin with his idol. He later appeared on "The Perry Como Show" and other TV programs. Silk and Steel was formed in 1993 when Michael Rosloff met Susanna Praetzel while substitute teaching in Santa Rosa. Both were taking time off from full-time teaching to focus on music. Rosloff was playing bass with singer Adina Sara, and Praetzel was lead vocalist for Instant Cowboy and the Human Torches. The couple eventually married and moved to Petaluma, where they became familiar faces downtown, playing at what was then Copperfield's Cafe in exchange for coffee, meals and postage for mailers. Rosloff began teaching computer classes at Tamalpais High School in Mill Valley and leading the guitar club after school, while Praetzel concentrated on substitute teaching for the English department at her alma mater, Redwood High School in Kentfield. "The babies began coming quick and I had to get a real job, " Rosloff said. For seven years they performed at the Kentucky Street coffee shop. They were introduced to Lawrence, who happened to teach at Petaluma High. He sat in with the band for a while before joining permanently, and transformed the duo into a trio. Silk and Steel became regulars at Borders bookstore in Santa Rosa and San Rafael, and played on local radio shows and at music festivals. Praetzel does most of the writing. Her songs focus on relationships - not the typical boy-meets-girl songs, but tunes about abortion, making choices and regrets in life. The band released its first CD, "Silk and Steel ," with songs such as "No Right to Cry," " Edge of Your Heart," and "Journey to the Moon." Lawrence writes his own instrumentals and has recorded several solo CDs, including "Mandolin Mezzotints", "The Brooklyn Rag", and "Phil Lawrence Plays Mandolin and Guitar". He calls his music mandolin jazz, with a touch of Americana. The teachers enjoy performing together, but admit the concentration required for their day jobs doesn't let them focus on their music as much as they would like. They are currently writing songs for a yet-to-be- named CD due out this year. Rosloff has a dream: He wants to open his own coffee shop . He would host local musicians and have place to play when he wants. "It's tough to be a good teacher and a good musician," he said. What do high school teachers and folk musicians have in common? No, it isn't a joke. The trio known as Silk and Steel is comprised of three teachers. Susanna Praetzel, a former English teacher at Redwood High School in Corte Madera and Michael Rosloff, a computer science teacher at Tamalpais High School in Mill Valley, are the married singer/songwriter pair who birthed the band within the 11 years they've been together. 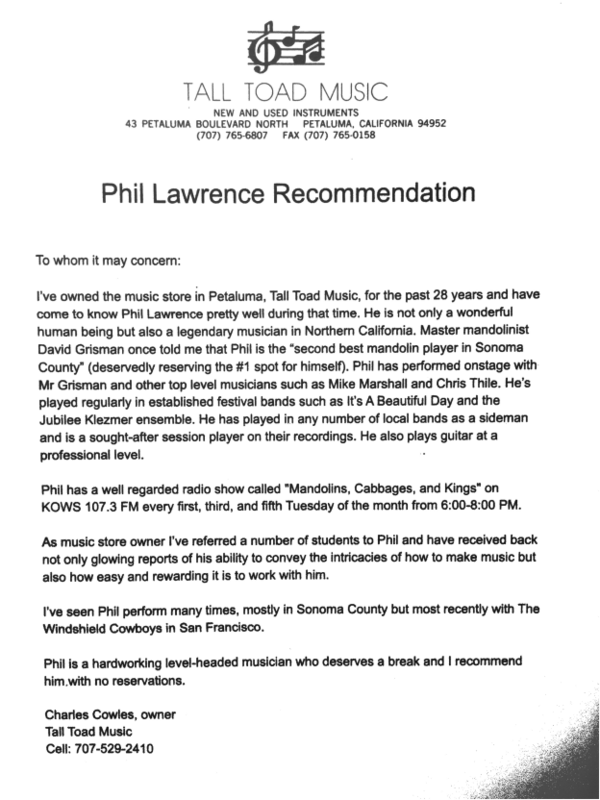 Phil Lawrence, an English teacher at Petaluma High, plays mandolin predominantly, though he is also a guitarist. He joined them in 1999, when he asked if he could play with them on stage at the former Copperfield's Café where they performed regularly on Saturdays. "I was thinking to myself, oh god, what if he's got no talent," admitted Rosloff, though momentarily his suspicions were proved unfounded. Lawrence has been with them ever since. Lawrence also plays in the Jubilee Klezmer Ensemble, Gyspy Djazz, and The DLT 3, an acoustic jazz trio. "My job is to find the places between their words, and to express that," Lawrence said. Since all three are teachers, like the chicken/egg conundrum, it's hard to say which came first, their inclination to teach or to share themselves through music. "I always sang and made up songs, since I was a little girl," Praetzel said. Rosloff made sure to point out that she is also a poet. Praetzel is taking time off from teaching to raise their 6-year-old son, but, as a former English teacher, she knows a thing or two about language and its effects. "Phil and I use music a lot in teaching. I often bring in a song to a class that is relevant to the literature we're studying, and sometimes sing a song that fits into a particular theme, such as war or prejudice. 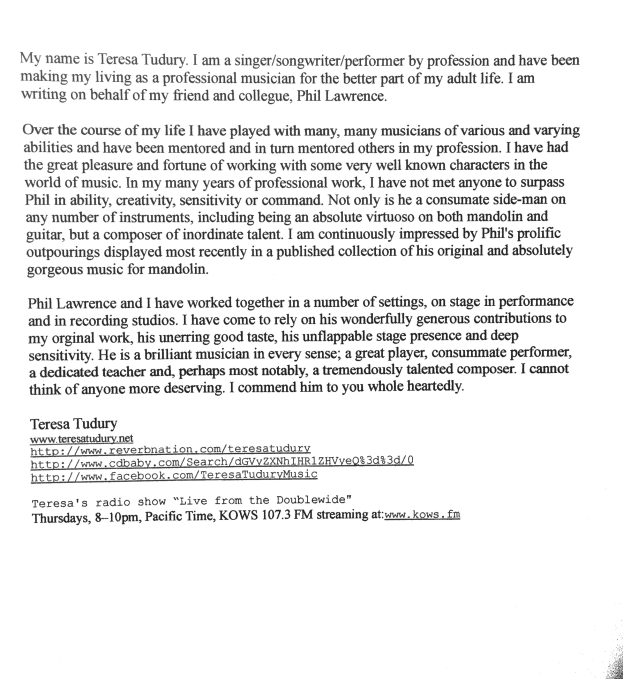 I've taught special classes on songwriting and taught lyrics as poetry." "Teaching and music definitely benefit each other," said Rosloff. "There's a drama to teaching, a need to hone your spontaneity that you learn through performing." Lawrence agreed. "In class you have to be always changing, learning to keep up with the students' needs and in music, you're constantly changing speed and tone," he said. At Tamalpais High School where Rosloff teaches, he also started a guitar club that has some 20 members and meets twice a week. The musical influences of the group range from Jerry Garcia and David Grisman to the Doobie Brothers and Art Garfunkel, with a little controversy over Bob Dylan along the way. Praetzel and Lawrence were both deeply impacted by Dylan's music; Rosloff does not share their opinion. Despite varying tastes, the music they produce does not seem to cause any arguments and reflects their more folk influences like Joni Mitchell and James Taylor, with emphasis on harmonies and personal lyrics. "There's not a lot we play that is meaningless," Rosloff said. "Our songs are pretty serious looks at aspects of contemporary life," Praetzel continued. "They're universal too. Anyone can relate to the images," Lawrence added. Though they describe their music as "dark" or "serious" the sound of their music, accompanied by the ethereal mandolin and the two different tones of Rosloff and Praetzel's voices is anything but dark. Silk and Steel's most recent self-titled album, according to Rosloff, "is really Susanna's album." "With this last album I tried to write about things that were scary to me. It was good to push past the fear. Some of the lyrics, I think, really reach out to people and let them know they're not alone. I felt like I had to write them," said Praetzel. Reaching people on an emotional level is easy. The trio described finding both men and women in tears at the end of their sets on different occasions. Finding venues to reach people is the trickier part. The trio will be playing at the Petaluma Coffee Café on May 15 at 7:30 as part of the Petaluma Folk Music Series coordinated by local Barbara Arhon. "I remembered them from when I used to go hear them play every Saturday night at Copperfield's. I thought their songs were so original and I've wanted them to come back," said Arhon. Playing a location of the size and scale of the Petaluma Coffee Café is right up their alley. "I love playing in a venue where you can actually be heard," said Rosloff. "Yeah, where people are there to listen to you, and they actually hear every lyric," added Praetzel. "I wish there were more venues like this for people to play our kind of music," Rosloff said. "To successfully play this kind of music on a regular basis, you have to travel," said Lawrence. Though they may not travel far outside of Sonoma County for the time being, their music continues to transport them and the audiences who hear them. May 15: Silk & Steel, Cindy Kalmenson, $15. May 29: Jon, David and Reid Fromer, folk and R&B. $10. All concerts start at 7:30 p.m. at the Petaluma Coffee Café, Second and H streets. Doors open at 6:30 p.m. Tickets are limited. For information and tickets, call Barbara at 781-3272 or visit www.geocities.com/petalumafolk/concerts. 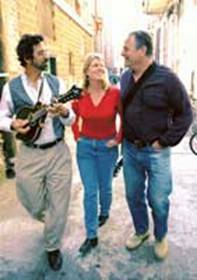 Phil Lawrence, Susanna Praetzel and Michael Rosloff will perform May 15 at the Petaluma Folk Music Concerts series. Photo by Terry Hankins. What do high school teachers and folk musicians have in common? No, it isn't a joke. The trio known as Silk and Steel is comprised of three teachers. Susanna Praetzel, a former English teacher at Redwood High School in Corte Madera and Michael Rosloff, a computer science teacher at Tamalpais High School in Mill Valley, are the married singer/songwriter pair who birthed the band within the 11 years they've been together. Phil Lawrence, an English teacher at Petaluma High, plays mandolin and guitar. The urban street has been an institution since the beginning of culture. The urbanist scholar Jane Jacobs argues persuasively that marketplaces and the towns that surrounded them actually predated formal agriculture. She says (in her theory built around the trading of obsidian) that only in an urban context could there have been the concentration of labor needed to separate and raise seed crops. So, wandering hunters and gatherers would pass through an urban setting founded on the strength of some primitive form of manufacturing/mining where they would trade for food products. From that concentration of bodies came the professional entertainer whose occupation wasn’t necessarily linked to a shamanistic function. The traveling singer, bone flutist, or what have you, probably rivals the prostitute as the oldest non-tribal professional. It is not surprising that in some cultures, prostitution and music making are still closely linked. Crossing the Mississippi, one finds communities whose roots are less than a century old. In those communities there is often a fundamental deterioration of what constitutes a street. The 20th century has seen the ravages of the two greatest villains of modern culture: Frank Lloyd Wright and Henry Ford, who, between them, have impoverished and denuded the American landscape—Wright by popularizing and romanticizing the suburb, which led to the creation of middle-class wastelands, and Ford by making cheap cars so that anyone could commute (and pollute) by private transportation. The automobile and the ranch house dealt a major blow to the tradition of street music. Imagine the difficulty of entertaining an homogenous audience by the side of the Santa Monica freeway. Even in rush hour, when your audience may creep by at a slow enough speed to enjoy your dulcet tones, playing without a gas mask would be a form of suicide. This is not to say that music played in the centuries-old manner has died, but that the local talent has had to innovate to survive. Recently, I was frantically searching for a processing lab in the streets of Berkeley, California., and stumbled across a pre-Christmas craft fair, complete with long-haired marshals controlling the crosswalks. While most of the stuff harked back to Berkeley heyday (hand-painted long johns, etc. ), one enterprising musician had his schtick down to a science. Phil Lawrence plays mandolin and guitar. Though he teaches, a portion of his income comes from selling tapes of his music at festivals in the Bay Area and on the streets of San Francisco. His booth or table is festooned with color-coded earphones corresponding to the color of labels on the cassettes which he invites you to sample. His simple, homespun music bar (soon to be copied by Tower Records, we are told) is quite effective. The tapes contain a mix of compositions—his own originals and traditional airs. I preferred the earlier music, which was strictly instrumental. Phil’s music is a worthwhile addition to your collection. Like most of what is reviewed in this column, it is the product of a home-built studio. A very different tape was one I collected outside trhe Pasta Bella restaurant on the Podium level of San Francisco’s Embarcadero Center. Silent Fountains is a wonderful mixture of Old Italian songs. The two musicians are old folk festival vets who have been playing together for ten years—just for the joy of it. They work the Bay Area’s Festival of the Sea, and have played Wolf Trap and the folk festival on the Washington Mall. Gino DiMichele comes from Brooklyn and owns a little guitar shop in San Francisco; 74-year-old Mateo Casserino, a retired cabinet maker from Sicily, plays the mandolin. The songs are played either with professional polish or tired indifference. Although I’m not of Mediterranean stock, Silent Fountains keeps me in pleasant company as I work. One of the logical places for street music is the shopping mall. Unlike the urban street, the shopping mall is controlled by a private company. More often than not the street musician is banned from setting up by whoever controls the mall. This is a short-sighted policy; malls are designed to replicate the human urban experience. What attracts people to a mall is not just the opportunity to buy, but the chance to watch and listen to other people. The mall operator may perceive the street musician as a parasite, and yet in truth the street entertainer who contributes to the ambience and excitement that brings the shopper out in the first place. Many mall operators have tried to organize and institutionalize the street entertainer with formal musical programming. Sadly, the result is usually bland, uncreative, and uninspired. There is a natural weeding-out process for street entertainers: those who don’t make the grade don’t make money. If a mall operator has any legitimate concern, it is that his or her mall not be the place where that weeding-out process takes place. Some mall developers have made a sincere effort to screen and encourage the street musician; yet again, based on bureaucracy, it becomes easier to program for the larger ensemble than to deal with the small group or individual player. While not to criticize or demean the ensemble, much of the historic charm and character of street music is found in the direct relationship formed between the musician and the small audience. What most street musicians exist on, above and beyond their modest earnings, are those magic, intimate, and often non-verbal moments that occur between them and the passing stranger.